Today’s review is 100% down to the recent Hotel Chocolat documentary. If you watched it you will recall in the first episode that the Hotel Chocolat Lady Marmalade was merely in the invention room. I have practically been dreaming about them since watching the show and finally I’ve managed to get hold of them, and am practical joyful that they made it to stores. The name, the look, the substance, it’s all on point. 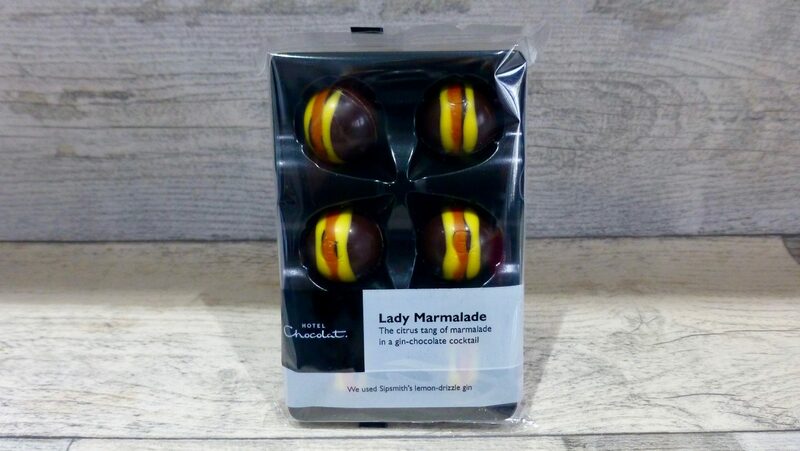 The Hotel Chocolat Lady Marmalade is a zesty citrus tang, gin marmalade chocolate cocktail, sounds wonderful doesn’t it! These are suitable for vegetarians and are free from artificial flavours and colours. 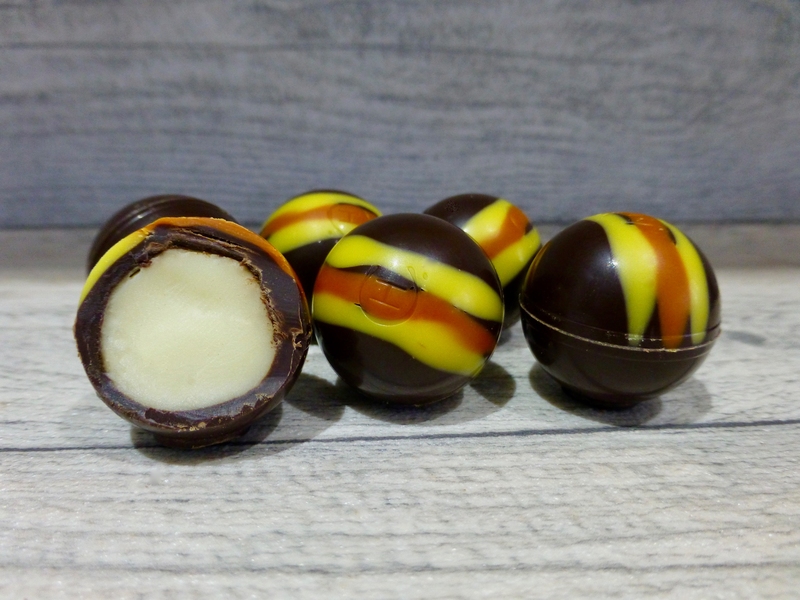 Coming in at the usual £3.95 a pop or 3 for £10.00, this selector pack comes with 6 vibrant filled chocolate domes, with some very generous filling. What is immediate is the smell. As soon as you open the packet it screams eat me. There’s citrus mixed with a real kick of alcohol along with a bitter dark cacao essence. The packet does come with a little warning – ‘Could blow your socks off’ and boy they were not wrong. What starts as a relatively zesty orange with bitter dark chocolate, which is both from the chocolate shell and the use of bergamot, the smooth inner was thick and just melted in the mouth. There was a tartness both from the sharpness of Cointreau and the Sipsmith Lemon Drizzle Gin, which was a genius move and gave it a twist. Just when you think where the kick is it hits you to make this one boozy choccie. Hands down this Hotel Chocolat Lady Marmalade is an absolute beauty. By far my favourite alcoholic truffle ever, and the ratios are just right. Although the kick of gin is quite the kick, it just feels absolutely right. A must try for any gin and chocolate lover!! What should be next on the Hotel Chocolat must try list?